Please call us on 0121 294 1141 Monday - Friday 9 - 5pm for a competitive price for Private Prescriptions. Getting started is simple, you just need to tell us the details of the items that you would like to order from your PRIVATE prescription, and give us some simple registration details. We will then request your prescription from your Doctor. Once we have obtained your prescription we will dispense and deliver it directly to your nominated address. This can be a home or work address. Please ensure you complete ALL of the sections marked with an * otherwise the form cannot be accepted. Please list any other medicines below. Prescription collection and delivery service required. 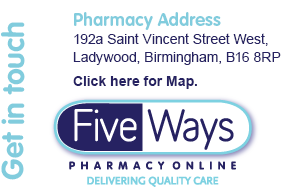 I authorise 'Five Ways Pharmacy' to collect my prescription from my surgery named above. Electronic prescription receipt and delivery required.